Joseph and Jacques Montgolfier, paper mill owners, were trying to float bags made of paper and fabric. When the brothers held a flame near the opening at the bottom, the bag (called a balon) expanded with hot air and floated upward. 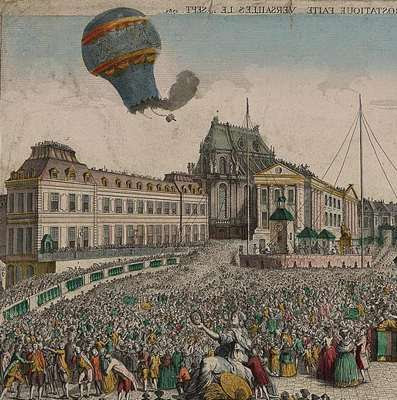 The Montgolfier brothers built a larger paper-lined silk balloon and demonstrated it on June 4, 1783, in the marketplace at Annonay. Their balloon (called a Montgolfiere) lifted 6,562 feet into the air. On September 19, 1783, in Versailles, a Montgolfiere hot air balloon carrying a sheep, a rooster, and a duck flew for eight minutes in front of Louis XVI, Marie Antoinette, and the French court. I see a picture. Do YOU? Whoopie!